Rhinoplasty is surgery to improve the appearance and proportion of the nose, enhancing facial harmony and as a result, strengthen self confidence. At times, this surgery may also correct impaired breathing caused by structural abnormalities in the nose. While the shape of your nose is usually the result of heredity, the appearance may have been altered in an injury or during prior surgery. 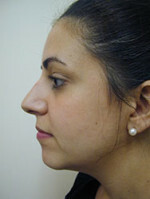 Often enough, rhinoplasty is done in conjunction with chin enlargement/reshaping. Rhinoplasty surgery can change the size and width of the nose in relation to the other facial structures, modify the profile by correcting humps or depressions, define the nasal tip that is large, bulbous, or drooping, narrow widened nostrils and correct any asymmetry and deviation. In both men and women, the goal is to change unwanted and unattractive features of the nose to a more pleasing appearance which is harmonious, pleasing and compositionally suitable to the remainder of the facial anatomy and concepts of beauty. However, these goals may vary from men to women. It is particularly important not to feminize the nose in men -creating a new but still strong anatomy and profile with well defined features which are compositionally pleasing to the specific face and to the male gender. In women, as opposed to men, the plastic surgeon may seek to achieve a more feminine look with features of the nose that are more refined, subtle and delicate. At your consultation, Dr. Simone will discuss your medical history as well as examine your nose both in outward appearance and within the nostrils. Your concerns and expectations will be reviewed and a decision well be made as to the best and safest approach. He will outline pre-op instructions, how the surgery is performed, post-op care, risks and complications. Surgery is on ambulatory/same day basis and is performed at Dr. Simone’s accredited Park Plastic Surgery Center or the ambulatory center at Lenox Hill Hospital. Be sure to arrange for someone to drive you to and from surgery and to stay with you for at least the first night following surgery. Anesthesia is usually local anesthesia with monitored deep sedation making surgery free of pain. Surgery of the nose is performed either using a closed procedure, where incisions are hidden inside the nose, or an open procedure, where an incision is made across the columella, the narrow strip of tissue that separates the nostrils. Surgery can reduce or augment nasal structures with the use of cartilage grafted from other areas of your body. If the airway is obstructed by a deviation of the septum, surgery can repair the defect and improve breathing. requires careful evaluation of the nasal structure as it relates to airflow and breathing. 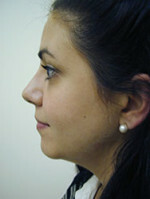 An external splint supports the nose as it begins to heal for approximately one week. While initial swelling subsides within a few weeks, it may take up to a year for your new nasal contour to fully refine. During this time you may notice gradual changes in the appearance of your nose as it refines to a more permanent outcome. Although uncommon, there are risks in rhinoplasty which may include: bleeding after surgery, infection, and scar development among others.